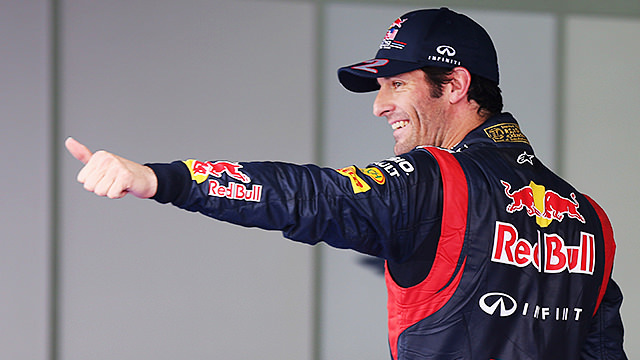 Welcome to F1Minute - Mark Webber pips Sebastian Vettel to Korean pole position. Qualifying at the Korean International Circuit kicked off with Narian Karthikeyan unable to complete a flying lap. The HRT driver suffered brake failure and spun off at high speed into the run off area, narrowly avoiding a Force India. Bruno Senna was the big name dropping out in the first session, although it was worryingly close for both Fernando Alonso and Lewis Hamilton. Towards the end of the second session, Daniel Ricciardo had to pull his Toro Rosso to a halt just off track, causing a yellow flag. That mixed things up a bit, as drivers lifted off. Jenson Button just missed out on the top ten, as did both Sauber drivers. Finally, into the top ten shootout and it was Sebastian Vettel, as expected, who took the provisional pole position during the first run. After a short stop for new tyres, the drivers hit the track for the last run, and this time it was Mark Webber who popped up to P1. Vettel crossed the finish line behind him but couldn’t improve on second place. Red Bull lock out the front row, with Lewis Hamilton and Fernando Alonso lining up behind them.